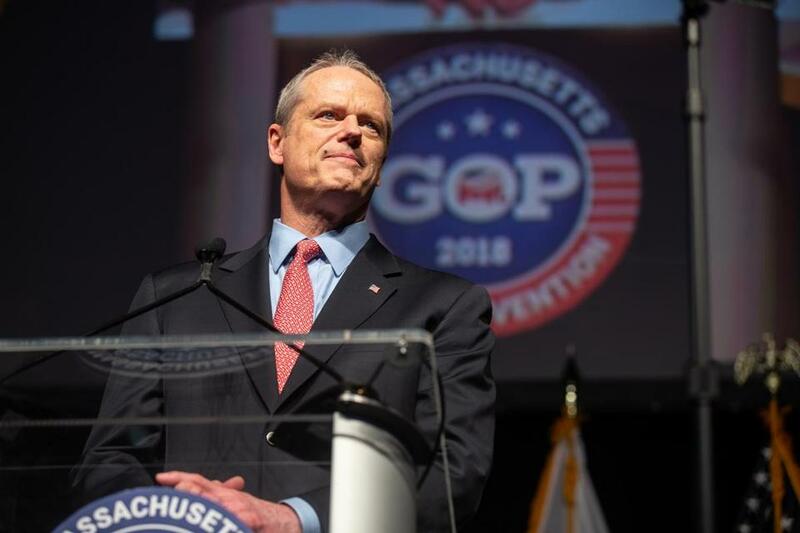 It is Governor Charlie Baker’s most sacrosanct policy position. The one he repeated on the campaign trail. The one that helped him win his close race in 2014. The one that’s easiest for voters to remember: No new taxes. No new fees. Now the Republican has a bill on his desk — one supported by large bipartisan majorities in the Legislature — that includes a sweeping paid family and medical leave program funded by imposing a new $800 million payroll tax on workers and employers in Massachusetts. So, will he sign the bill? The bill would establish a program that would allow almost all employees to take up to 12 weeks of paid family leave and up to 20 weeks of paid medical leave — with a guarantee that they could return to their same or equivalent positions, with the same status, pay, and employment benefits. Activists and business leaders who have been pressing these ballot questions are set to meet with legislative leaders on Wednesday — but they could still walk away and go to voters. The program would be funded through a 0.63 percent payroll tax that would average between $4 and $4.50 weekly per employee, according to Senator Jason M. Lewis, a Democrat from Winchester, who helped craft the bill. The cost would be split roughly 50-50 between employee and employer, he said. Workers would see a deduction from their take-home pay starting in the summer of 2019, with the leave benefits available to them starting in 2021. Speaking on the Senate floor last week, Lewis estimated the annual cost of the program at $750 million to $800 million, a range that outside analysts confirmed was in the ballpark. The legislation, known on Beacon Hill as the grand bargain, would also raise the minimum wage to $15 by 2023, eventually eliminate time-and-half pay on Sundays and holidays, and create a yearly sales tax holiday. Baker has until July 1 to act on the package. The bargain moniker comes from the expectation that, in return for the bill becoming law, advocacy groups will drop three proposed ballot questions that seek to lower the sales tax to 5 percent, raise the minimum wage, and create a paid leave program. Several parts of the bill have drawn concern from the business community, including the new payroll tax. 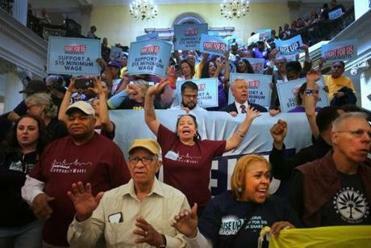 “The grand bargain’s new paid family and medical leave program is funded by a payroll tax, very similar to how the unemployment insurance and Social Security programs are funded,” said Eileen McAnneny, president of the business-backed Massachusetts Taxpayers Foundation. And in a 2015 interview with the Globe before he was sworn in, Baker affirmed that his no-new-taxes, no-new-fees pledge was an irrevocable promise — with one caveat. At the time, Baker said he would not consider it a violation of his pledge if the state rolls out a “new service” that has never been offered and attaches a charge to it. If the governor signs the bill, it would fall under the new service category, aides said Monday. That’s how his administration framed a law Baker signed regulating ride-sharing services such as Uber, which slapped a 20-cent per-ride fee on the transportation network companies. It’s part of how aides framed Baker signing into law a rewrite of the voter-passed marijuana legalization measure, which increased the state’s not-yet-implemented pot tax above what voters had approved. Baker also supports subjecting short-term rentals booked through websites such as Airbnb to a new tax, a move he said last week is about “leveling the playing field.” That is, if someone is running what is effectively a hotel out of their house using Airbnb, their guests should pay the state’s 5.7 percent room occupancy tax, just like someone staying at a Hyatt or a Hilton. But even as he backs those new sources of revenue, Baker has touted his support for lowering one big tax and holding the line on others. But low-tax activists say talk is cheap. “There’s no way other than describing it as a new tax. It’s not an old tax, it’s not in existence now. Every tax increase has its rationale and its explanation and its excuse. It doesn’t make it any less of a tax,” Ford said. Baker faces a challenger in the Republican primary on Sept. 4. Joshua Miller can be reached at joshua.miller@globe.com. Follow him on Twitter @jm_bos. Matt Stout can be reached at matt.stout@globe.com. Follow him on Twitter @mattpstout.